There are a lot of things that make it hard to fly with kids. After you deal with the actual parenting part of bringing your little ones on the plane and trying to keep them calm for the duration of the flight, you have to deal with the eye rolls of less-than-sympathetic customers and flight attendants, and to top it all off, it usually costs a pretty penny to travel together once your kids are too old to sit on your lap. Well, one airline is actually encouraging people to fly with their kids. Frontier Airlines just introduced a Kids Fly Free policy. Families can have one kid 14 years or younger fly for free for every adult in the group. 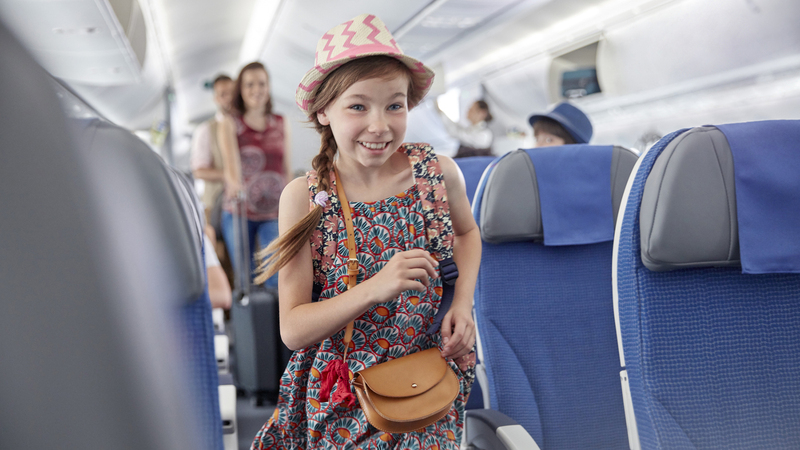 According to Travel Pulse, Barry Biffle, president and CEO of Frontier Airlines, said, “Kids Fly Free shows our continued commitment to being America’s affordable and family-friendly airline.” It’s nice to see an airline that actually seems excited about having kids on board! But there is a slight catch — you have to be enrolled in the Frontier Airlines Discount Den program in order to get the free pass. That’s just $60 a year and can include up to six travelers on one itinerary. Just look for the flight you want, add The Works bundle to your purchase (it includes priority boarding for families with small children, the ability to modify the itinerary and even lets you cancel your flight if need be) and bring your kids to the airport. Frontier does have a few, erm, quirks you should know about before taking the family on a trip. They’re a bare-bones discount airline, meaning you have to pay extra for almost everything, including seat selection and both checked and carry-on luggage, and there’s no in-flight entertainment or complimentary beverage service. That being said, if you’re making a short domestic flight with the family, pack your own snacks, fill up those water bottles in the airport and bring along some books or an iPad to keep the kids busy. You could still end up saving both money and your sanity on your next family vacation.